This study surveyed a random sample of 1,963 middle school students (mostly aged 11-14) from a large school district in the southern United States. Data were collected in in the spring of 2007 from 30 different schools. Click on thumbnail images to enlarge. Teen Technology Use. Online games are the most popular activity reported with nearly 83% of students reporting that they had played online games in the previous week. 75% of students now have their own cell phone. Chat rooms are starting to fall out of favor among this population. Cyberbullying Offending and Victimization. We define cyberbullying as: “Cyberbullying is when someone repeatedly harasses, mistreats, or makes fun of another person online or while using cell phones or other electronic devices.” Approximately 17% of the students in our sample report experiencing cyberbullying in their lifetimes (9.4% in the previous 30 days). Similarly, about 17% of the students in our sample admitted to cyberbullying others in their lifetimes (8.2% in the previous 30 days). About 12% had been targeted and had targeted others online in their lifetime. 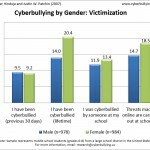 Cyberbullying by Gender: Victimization. 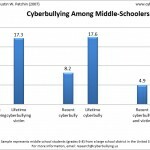 Adolescent girls are significantly more likely to have experienced cyberbullying in their lifetimes (20.4% vs. 14.0%). This difference disappears when reviewing experiences over the previous 30 days. Girls are also more likely to believe that online threats are carried out at school. 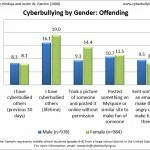 Cyberbullying by Gender: Offending. Girls are also more likely to report cyberbullying others during their lifetime (19% vs. 16.1%). The type of cyberbullying tends to differ by gender; girls are more likely to post a picture online without permission while boys are more likely to send a hurtful email message.